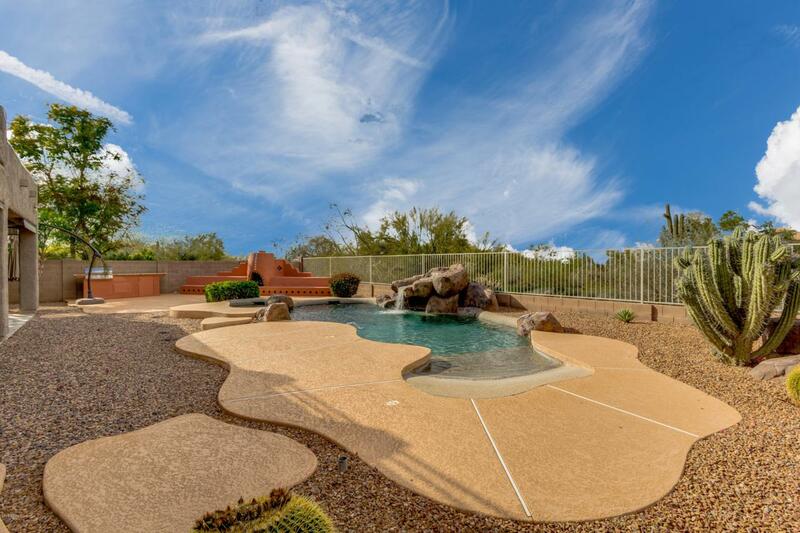 Exquisite, private Sonoran estate located in the exclusive gated community of Desert Wind! Pristine landscape leads to stately front gated portico. Entry graced with soaring ceilings, freshly painted interior, and immaculate design. Updated appliances including high-efficiency A/C in 2018! Well-appointed kitchen w/ granite counters/marble accents, stainless steel, glass cabinet fronts & many thoughtful touches. Master has stunning mtn views, & master bath boasts Italian porcelain tile. Remaining second level beds have ensuites, downstairs bed/office has dedicated bath. Resort-style backyard has self-cleaning heated pebble-tec pool/spa, SS island grill, gas fireplace, and misters in a secluded desert setting! Updated flooring & ample added storage! This home is awaiting your arrival & tour!